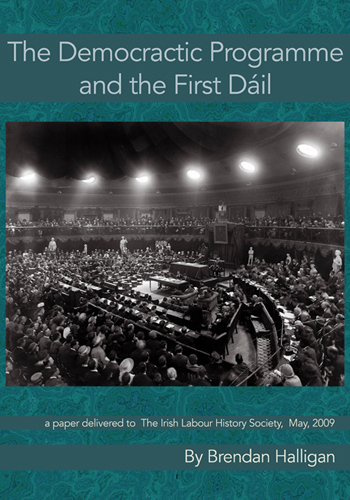 In a broad-reaching study of this, one of most fascinating developments in the early history of the Irish nation, Brendan Halligan explores the build up to the first Dáil’s drafting and adopting of their crucial “Democratic Programme” on 21 January 1919. Born in Liverpool, Tom Johnson moved to Ireland in the 1890s and became one of the most important Labour and Trade Union activists in the country. 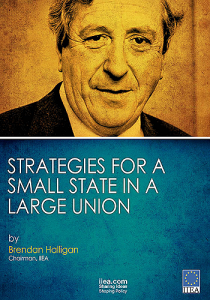 In 1978, The Irish Times published a series of essays by Brendan Halligan about Irish Labour Party History, from Labour’s landmark decision to stand aside and permit Sinn Féin to contest the 1918 General Election to the disappointing results of the much anticipated 1970 elections. 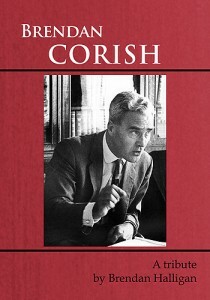 One of the great contemporary Irish Labour leaders , Brendan Corish was a man both revered and admired by his peers. Here Brendan Halligan pays tribute to him as a consummate parliamentarian, a skilled debator and orator, an industrious committee man, but above all, a charismatic leader. 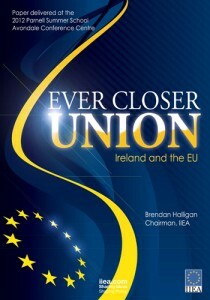 The phrase “ever closer union” implies a dynamic process where the aim is to bring the peoples of Europe closer in a series of steps, as defined by the original six founding countries of the European Union. In this paper, Brendan Halligan explores this process. 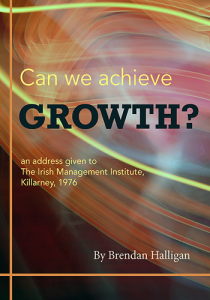 In an address given to The Irish Management Institute at Killarney, Brendan Halligan looks at the challenges of the serious employment problems that Ireland faced as a people in 1976, and the opportunities that might be explored to remedy the issue. 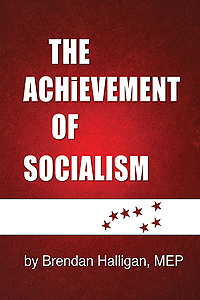 To download a PDF of this publication: Can-We-Achieve-Growth? 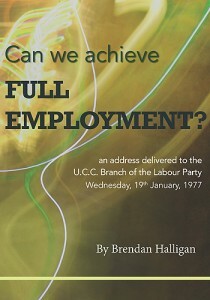 Brendan Halligan, in this address to the UCC Branch of the Labour Party in January 1977, further explores this burning issue of the day, examining the history context, and the crucial influence that emigration had on Ireland’s work force in the sixties and seventies. To download a PDF of this publication: Can-We-Achieve-Full-Employment? 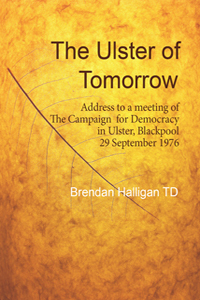 Originally delivered as an address to The Campaign for Democracy in Ulster, at the British Labour Party at Blackpool in 1976, this paper explores how political forces faced the realities and difficulties of the political situation in Northern Ireland of the day, and attempts to identify a means of defending and strengthening democracy there. 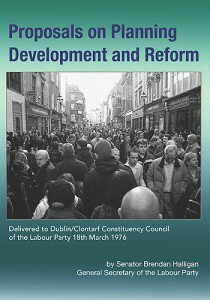 A paper that examines the need for proper planning and development in Ireland in the late 1970s – at a time of crisis for the country. 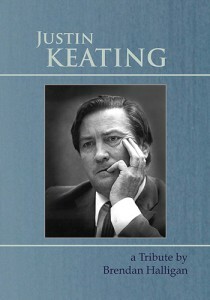 A tribute to one of Ireland’s best known figures, Justin Keating, who was a key figure in the new Labour Party created by Brendan Corish in the 1960s and served as Minister for Industry and Commerce in the National Coalition Government from 1973–77. 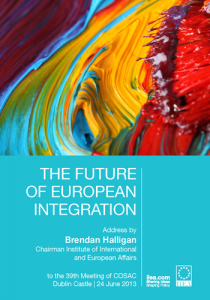 Examining the future of European integration as a process in which sovereignty is being progressively shared on a voluntary basis by countries which elect to do so, Brendan Halligan focusses on three separate but inter-related aspects: an enlarging membership, an expanding agenda, and a deepening interdependence. 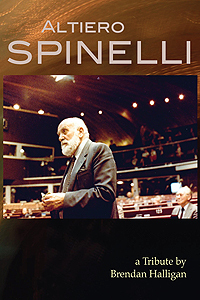 One of the founding fathers of the European Union, Altiero Spinelli was a co-author of the historic Ventotene Manifesto, an influential figure in the European federalist movement and later a member of the European Commission, and MEP. This paper explores the man, his personal story and his success as a European innovator and facilitator. 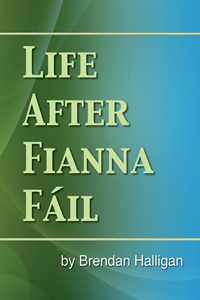 This piece, written in 1983 at a time of extreme challenge for the Irish Labour Party, was based on a contribution made by Halligan to the Dublin Regional Council symposium (June 1983) about the future of the party, with particular reference to the importance of its commitment to coalition. One of Ireland’s true international Statesmen, Garret FitzGerald became Foreign Minister at the moment Ireland joined the EU. The paper’s primary focus is statecraft, and how he managed the affairs of a nation in its relations with the outside world. This document, from the archives, is an address given by Brendan Halligan to the Dublin Institute of Adult Education in 1968, five years before Ireland finally joined the EEC. Noting that the move into Europe was to be a political move, as opposed to an economic one, Brendan explores the implications of this, and the prospects for the coming years of a new Europe. Another document from the archives: this time on a crucial issue that caused passionate controversy in Ireland at the time. 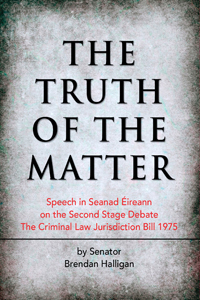 The Truth of The Matter is Brendan Halligan’s speech in Seanad Éireann during the Second Stage debate on the Criminal Law Jurisdiction Bill of 1975. 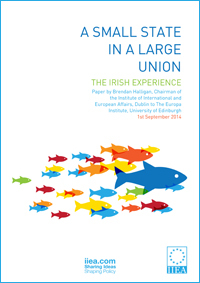 Brendan Halligan recently gave a lecture on A Small State in a Large Union: The Irish Experience to the Europa Institute at the University of Edinburgh on 1 September 2014. 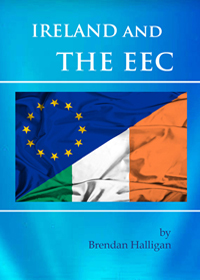 It focuses on the political strategy employed by Ireland throughout its membership of the EU and analyses the principles upon which it is based. 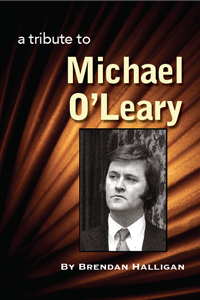 Michael O’Leary, former Labour Party Leader, Minister and TD, died in France on 11th May 2006, just three days after his seventieth birthday. 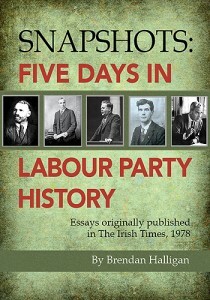 His career in Labour politics occupied just two decades of a long and colourful life, yet they defined the man. lt is for those years he will be best remembered, not just as a successful Labour politician and Minister but as an enigma. 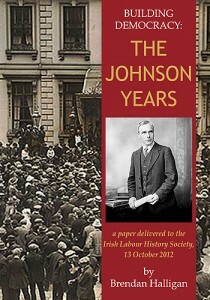 In this essay, delivered as an address to the 2011 AGM of the Dublin South East Constituency Council of the Labour Party, Brendan Halligan makes connections between the General Elections of 1918 and 2011, and considers how history came to re-write itself. 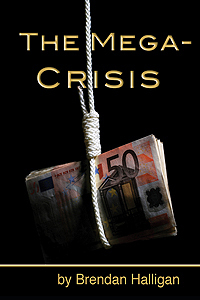 Written on 12 October, 2010 – one month before the EU and IMF came to Dublin for bailout talks, Brendan Halligan examines the nature of the Irish monetary crisis, and makes some cogent observations on the exact nature of the Irish “Mega Crisis”. A speech given by Brendan on the occasion of the address by Ban Ki-Moon, Secretary General of the United Nations. 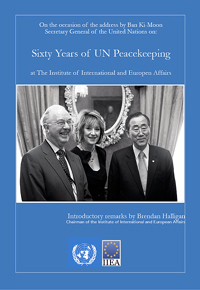 Visiting the IIEA, the speech was entitled: “Sixty Years of UN Peacekeeping at The Institute of International and Europen Affairs”. 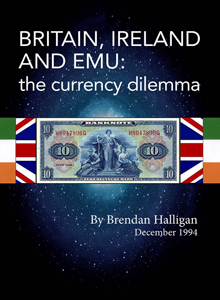 Three years before the Maastricht Treaty was due to come into effect in 1999, Brendan Halligan wrote about the proposed monetary union, exploring the complex economic relationships between the major European players, and possible repercussions for Ireland. 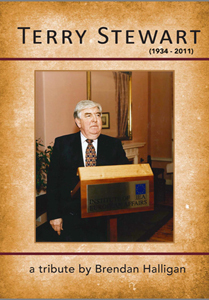 SDLP Leader, diplomat and former Director General of the IIEA, Terry Stewart was a popular and figure both North and South of the border. In this insightful tribute, Brendan Halligan looks at the man and his life in all its facets. “This week, for the first time, an elected representative of one of the three main political parties went on record as supporting the introduction of abortion into this country. 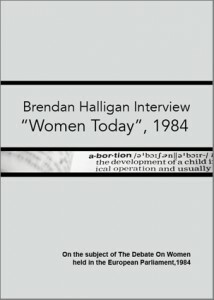 The politician is Labour Euro MP Brendan Halligan, and he took the step when he voted in the European Parliament’s Debate on Women in Strasbourg on Tuesday…” Marian Finucane, ‘Women Today,’ RTE, 1984. 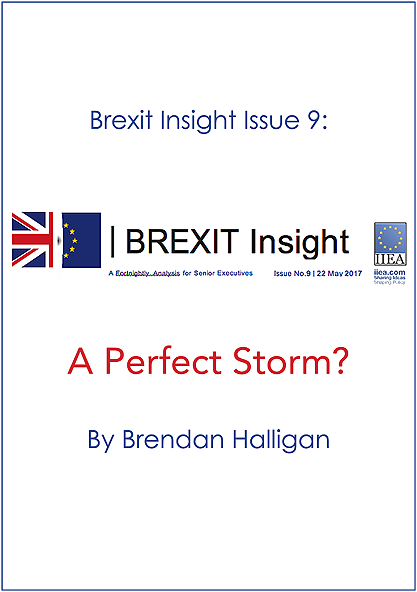 BREXIT Insight No 9: A Perfect Storm? With BREXIT currently at the forefront of Irish political and economic concerns, Brendan Halligan her contributes to a series of analyses of the situation from a series on the IIEA website, “BREXIT Insight”. This contribution is No 9 in the series, and was published 22 May 2017. This article was published on 4 April, 2017 in The Courant, an independent publication. 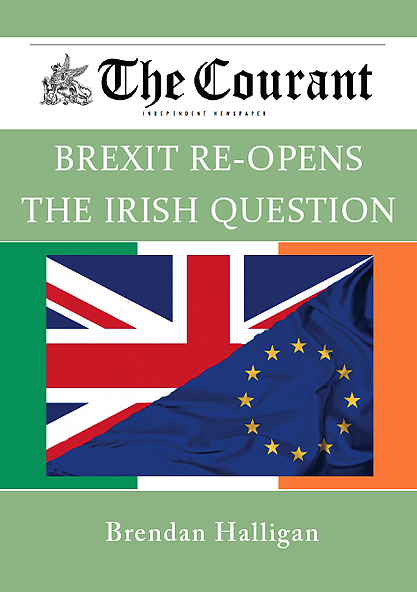 It looks at how the BREXIT move has opened a long-standing question in the Republic of Ireland. 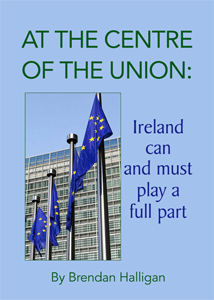 AT THE CENTRE OF THE UNION: Ireland can and must play a full part. At his recent address to the MacGill Summer School, Brendan Halligan discusses Ireland’ current position in the EU in relation to BREXIT and why it is vital to remain at its centre. This year’s MacGill Summer School, now in its 38th year, was a week of broad-ranging ideas and reflection. Brendan Halligan’s contribution was a paper that explored the history and nature of democracy, noting how it is a more recent phenomenon than most people realise, and importantly, how it is much more fragile than people are willing to admit. 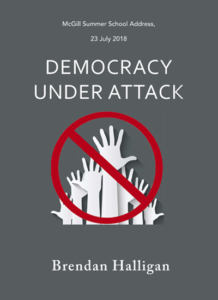 He elucidates why democracy is currently under increasing, significant threat and proposes actions that are needed to safeguard its survival. To read the full text, click here or download a PDF here.